ePOS-Print is a technology for controlling the TM printer from Web applications and smart devices such as a smart phone or tablet. ePOS-Print SDK has been migrated to Epson ePOS SDK. Epson products and functions released after the release of Epson ePOS SDK do not support ePOS-Print SDK. We recommend to migrate applications developed using ePOS-Print SDK to Epson ePOS SDK. For instructions on how to migrate, refer to "Epson ePOS SDK Migration Guide" that is included in the Epson ePOS SDK package. ePOS-Print SDK is a development tool package for the ePOS-Print. ePOS-Print SDK is made up of the following development tools. 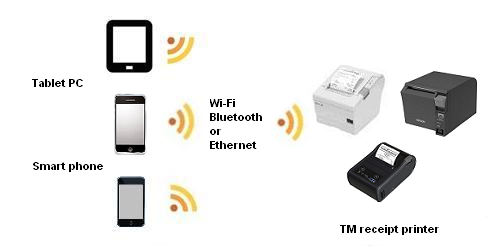 The applicable products for ePOS-Print SDK are TM printers. The applicable products differ depending on the development tool. Using the development tool has many benefits for an application development. (1)ePOS-Print SDK has application interface (API). So the programmer doesn't need to understand ESC/POS command to control TM printer, and the programming to print a receipt becomes very simple compared to a SDK without API. (2)ePOS-Print API command format and the function are almost similar between each ePOS-Print SDK. 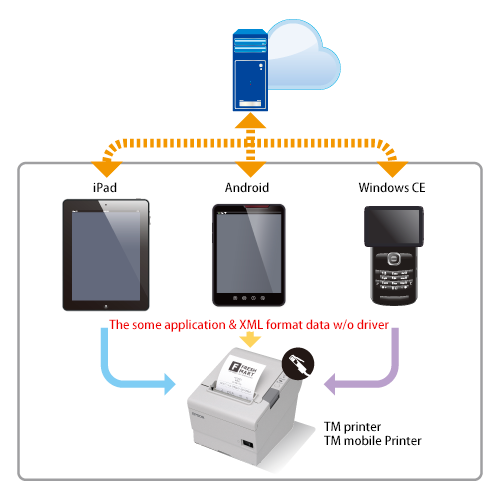 So the application programmer can control the TM printer(s) in the same way for the web application or native application development. These SDK are the SDK aimed at development engineers who are developing native applications based on each OS for printing on a TM printer using Wi-Fi, Ethernet, Bluetooth, or USB (Android only) interface. When registering an application in the App Store, Epson must submit the application to Apple in advance. Please apply for each application you want to register in the App Store from the URL below.